IMPORTANT: Please make sure you choose a fabric and indicate the name when you order. Thank you. Lacy Pouch Covers are made with soft lace and is very decorative. The Lacy Pouch Cover is an everyday cover. Pouch Covers are available for women, men and children. The front cover is made with 100% cotton or a cotton blend. No other pouch cover is made with such craftsmanship and guaranteed to satisfy the customer. All seams are sewn so as the material will not ravel. The pouch cover is manufactured to match the shape of the customers pouch (bag). Pouch covers are made for either a drainable or closed end pouch. The pouch cover is not removed for drainage. The stoma opening is custom made to the flange opening. The back (next to the body) fabric is a “wicking” material. The “wicking” material is special formulated to assist with the removal of moisture and help keep the skin healthy under the pouch. The "wicking" material is color coordinated to the front side. All Koolostomy products are machine washable although hand washing is recommended. 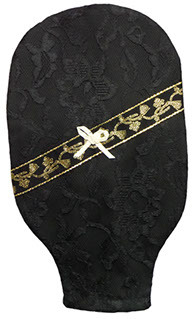 Items with additional details such as lace, ribbons and bows should only be hand washed. Drying is best done by hanging the product over a line/towel rack or laying it flat. Please be aware that drying in a dryer may result in shrinkage and material damage. In addition, please note some materials may hang better if they are pressed on low heat after drying. © Copyright KOOLOSTOMY 2015. All rights reserved.